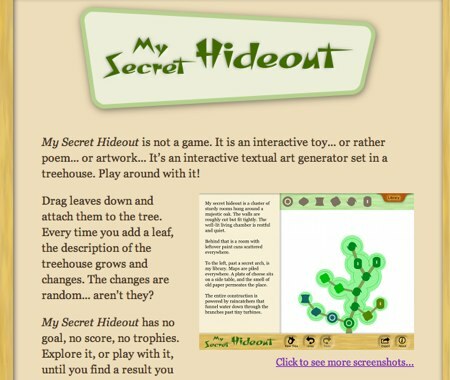 My Secret Hideout is a new iPad app by renowned IF creator Andrew Plotkin. The user uses the touchscreen to move various node shapes onto a tree interface, with each addition creating or lengthening one of the trees branches. As the user adds nodes, the prose in the text pane changes with additional details about a secret hideout. The user is free to move nodes or even whole branches after they are placed, and the prose will still change accordingly. Em Short wrote a thoughtful critique of the work. She muses on how we might categorize a piece like this. This isn’t in any meaningful sense a game: there aren’t any goals, scores, win/loss states, etc., and it’s hard even to see how one might project such things onto the structure. To the extent it is a toy, the toy-nature is about figuring out how it does what it does and how much agency you can reasonably exercise over the output. My Secret Hideout is the generative prose version of a sandbox “game” like Minecraft, where the focus is on creating and changing a world. But that’s not an all-encompassing description. “Toy” is probably the most apt: it promotes play and encourages the interactor to push the boundaries of the system, to experiment with combinations not because we are particularly interested in the changing output, but because we want to understand how that output is being created. Once we understand it, we can then play with our decisions to craft the prose, or draw aesthetically pleasing trees, as we see fit. My interaction with Hideout reminded me very much of my experience with ToneMatrix. 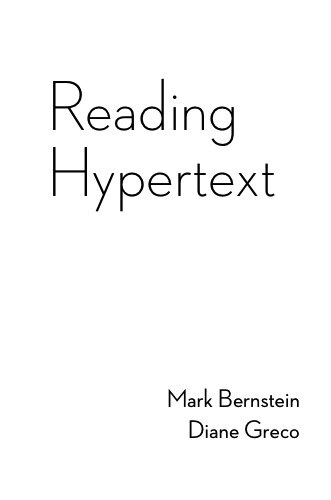 As I approached the piece I made random decisions to try to figure out how the system was interpreting my inputs, then used that understanding to create artistic pieces within the app’s framework. My Favorite Hideout has a library in which you can save your creations.